PURE Edibles BOGO On 4-Pack Caramels at Health for Life - NORTH Dispensary! Come in between 9AM and 12PM to receive this awesome promotion! 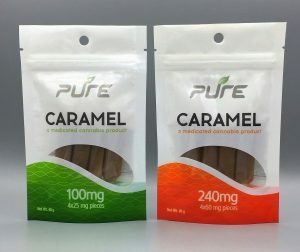 PURE Caramel packs come with 4x25mg pieces or 4x60mg pieces, so there is an opportunity for patients with a variety of experience medicating with edibles! Don’t miss your opportunity to stock up on Cannabis edibles! Check out PURE Caramels in the edible counter at the back of our Dispensary! Amy & Al's Patient Appreciation Day!